This is an incredible healing tree that I fell in love with while visiting the British Virgin Islands and hope to grow it in Maine! 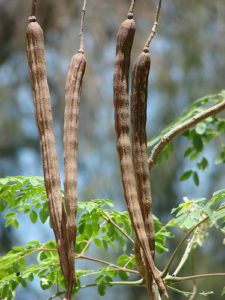 Moringa oleifera, also known as drumstick tree, is a highly valued and versatile plant which belongs to the Moringaceae family. It is a fast growing, deciduous tree that is native to India and is widely cultivated in tropical and subtropical areas all over Asia, Africa and South America. 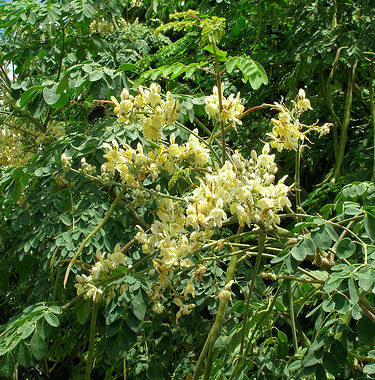 It is widely known with many other names, including Horseradish tree and Ben oil tree. The health benefits of Moringa oleifera include relief from stomach disorders,allergies and edema. The antioxidant power of moringa aids in liver protection, diabetes, eye protection, cardiovascular health, bone health, uroliathiasis, wound healing, healthy hair and skin. It is rich in antibacterial and antifungal properties that help to fight various infections, including herpes. Moringa oleifera also helps in improving sensory perception and memory. It possesses anti-epileptic properties and helps in combating depression, anxiety and fatigue. Anti-inflammatory properties and the high vitamin content of moringa are valuable for treating scurvy and catarrhal conditions. It is useful for the regulation of thyroid hormones and is effective in curing skin infections and sores .Moringa is rich in vitamins, minerals, and amino acids. It contains significant amounts of vitamins A, C, and E; calcium; potassium; and protein.It is a highly nutritious plant and is generally safe for consumption.. Thanks for sharing this amazing benefits of Moringa, it has been a great help. Keep sharing and caring.